What do you get if you combine NetEnt’s Stickers with an old-school fruit machine and jazz it up in true Thunderkick style? 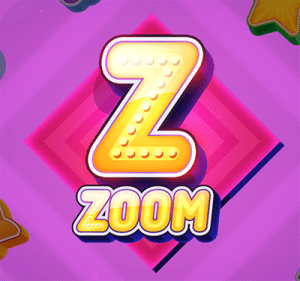 The result is Zoom, a fresh new pokies game that puts an entertaining and rewarding spin on traditional gameplay, with the addition of a sixth reel, expanding wilds and re-spins to kick things up a notch. Find out how and where to play this lively, colourful game for real money bets at the leading online casinos. 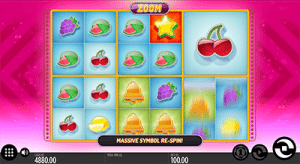 Zoom is an innovative six-reel video pokies game with 64 fixed paylines and many unique features. The reels are divided into six separate “zoom areas” where each area is 2X2 symbols in size. Each zoom area can contain a maximum of one zoom symbol per spin or re-spin, which is where the biggest winning potential lies. If this all sounds too confusing, never fear, as all you need to worry about is selecting the amount you wish to bet. To place your wager, click on the ‘bet’ button at the bottom of the screen. Here you have the option of clicking on your desired bet size, with minimum bets starting at $0.10 per spin and going all the way to a max bet of $100 per spin. Paylines are fixed so whichever size bet you choose you’ll be playing over all 64 paylines. There’s also an auto-spin option where you can place up to 5,000 spins with the click of a button. 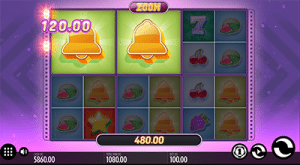 Zoom is all about colour and vibrancy, with symbols made up of classic slot symbols like cherries, grapes, watermelons, liberty bells, lucky sevens, stars and lemons. The grid-like format of the six reels with Zoom Areas turns an otherwise average game into an extraordinary play experience like nothing else you’ll find from a land based pokie machine. Wild symbol – the orange and red wild symbol can substitute for all other symbols to form a winning combination, except for the zoom symbol. Zoom symbol – the Zoom symbol is what this game is all about. It works like a scatter symbol, but can expand to become a Massive Symbol and is responsible for triggering the rewarding re-spin feature where you get an extra free spin on top of your winning spin. If the Zoom symbol is present within four of the zoom areas, a Super Massive Symbol emerges, expanding to fill a large part of the reels in order to trigger some truly epic wins. When Zoom Re-spins occur, the reels light up with neon lights and the background changes colour, so you really feel the excitement of each win. There are no other bonus features like mini-games or gamble buttons, but the Zoom symbol more than makes up for that, with wins and re-spins occurring regularly during our testing. The Thunderkick name is fast growing in popularity, and Thunderkick games can now be found at several of our favourite online casinos. If you’re looking for a safe pokies site that’s legally licensed and offers a range of secure deposit options using the Aussie dollar, the top rated venues listed in our casino table above get our vote. Register for an account at any of these casinos via our page and you’ll be welcomed with some fabulous rewards upon sign up, including free spins and matched deposit bonuses to kick start your online pokies experience. Zoom is not your average pokies game. Firstly, Thunderkick has a way with games where you can tell the amount of thought and creative energy that’s gone into each one. Secondly, Zoom has taken the standard pokies format and turned it completely on its head, while still retaining all the familiarity of usual gameplay so that players won’t be turned off by the unknown. The graphics are crystal clear and pleasing to the eye, and overall Zoom has an upbeat and happy vibe to it. We predict this may be the start of a trend of six-reel games emerging – give it a go and see for yourself how the zoom areas work. Sign up to play Zoom and other Thunderkick pokies at Slots Million and receive a welcome bonus of up to $100 plus 100 free spins to use on selected NetEnt games. You can also read more reviews of the latest pokies games here.